It is difficult to think of a resource more essential to the wellbeing of people and their economies than water, yet managing water resources is a complex and challenging task. 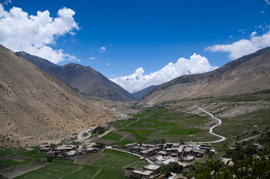 The Hindu Kush Himalayan (HKH) region heavily depends on water resources for irrigation, food, hydropower, sanitation, and industry, as well as for the functioning of many important ecosystem services. Water thus directly contributes to the national GDP and to livelihoods and income generation at the local level. Although water is the foundation of sustainable development, water management in the HKH region remains fragmented and uncoordinated, and does not take relevant regional issues into account. Many big rivers like the Indus, Ganges, and Brahmaputra originate from the snow and glacier covered high mountains, and have abundant seasonal and annual water supply. Despite this, mountain people living on the ridges and hill slopes have limited access to water for drinking and agriculture. Throughout the mountain region, springs are reported to be drying, and mountain agriculture has suffered from drought. The shortage of water has placed an increasing burden on mountain communities, particularly on women. Furthermore, the communities face loss of property and lives due to water-induced natural hazards. Climate change has exacerbated the situation by creating uncertainty about the future water availability and water security. Understanding the characteristics of water is crucial for sustainable water management. This article attempts to highlight some of the complexities and challenges of water management in the HKH region and discusses a possible way out for sustainable management. Energy is one of the most important pillars of sustainable development. In the HKH region, hydropower is one of the most promising environmentally friendly sources of energy. With a potential estimated to be 500,000 MW, the region has abundant opportunities for hydropower development. Energy security can open up opportunities for development and employment and contribute to the national GDP. Moreover, innovative solutions such as electric transportation and a clean source of domestic and industrial energy supply would significantly improve the deteriorating environmental condition of the region. However, many countries in the region have been able to tap only a small fraction of their available potential. Out of the 42,000 MW potential reported in Nepal, only about 2% is harnessed so far, whereas Pakistan has harnessed 11% of its total potential. Still, people in both these countries face many hours of scheduled power cuts. Water plays a vital role in maintaining different ecosystem services in riparian areas. Freshwater ecosystems in particular largely depend on the specific flow regime of rivers passing through them. However, due to intervention of infrastructure development, the flow regime changes in the downstream areas, where, in many cases, communities depend on water resources for livelihoods such as fishing. A major concern is how to make sure that a certain minimum flow is maintained so as to sustain freshwater supply and support dependent ecosystems. There is very weak monitoring of the minimum flow requirement in the region. Water and food share a strong nexus, both being essential ingredients for human survival and development. Agriculture is a major contributor to the GDP of countries in the HKH. In Nepal, it contributes to 35% of the national GDP. The Indus River system is a source of irrigation for about 144,900 hectares of land, whereas the Ganges basin provides irrigation for 156,300 hectares of agricultural land. Access to water resources for food production and their sustainable management is a concern from the local to national level. Amid rapid environmental and socioeconomic changes, the growing population will require more water and food, and equitable access to vital resources has become a major question. Sustainable solutions to these problems require efficient use of water resources for agricultural use in which technological innovation plays a vital role. Due to its physical setting, the HKH region is prone to various water-induced hazards (e.g., landslides, floods, glacial lake outburst floods, and droughts). Every year, during the monsoon season, the floods bring havoc to the mountains and the plains downstream. These floods are often transboundary. Globally, 10% of all floods are transboundary, and they cause over 30% of all flood casualties and account for close to 60% of all those displaced by floods. The social and economic setting of the region makes its people more vulnerable to natural hazards. Lack of supportive policy and governance mechanisms at the local, national and regional levels, and the lack of carefully planned structural and non-structural measures of mitigation lead to increased vulnerability. The examples above show that water has both beneficial and adverse traits, its management is complex, and often a regional approach is necessary. The hydropower potentials are primarily concentrated in the mountain regions have but the major users of the energy are the urban areas and industries in the plains. Strong technical and political barriers separate those regions, which is one of the major reasons of slow progress in hydropower development. However, recent trends have shown some positive change. In the recent 18th SAARC summit in Kathmandu, the SAARC member countries signed a Framework Agreement on Energy Cooperation. This agreement has opened up the energy market in South Asia, and thereby possibilities for cooperation in the energy sector. However, it remains to be seen to what extent the collaboration would play a role in energy security. There are strong indications the HKH region is going to be warmer in the coming years. Precipitation is likely to increase in different places and have more inter-annual and intra-annual variability. What does the change in temperature and precipitation mean to water availability in the HKH region? What complexities do the cryosphere dynamics add to this equation? Should these changes be of concern to water resources development in the region? These questions cannot be answered without concerted efforts of the regional countries. The regional nature of the natural hazards requires a regional approach to the solution. Effective flood management requires sharing data and information between the upstream and downstream areas, not only within the country, but also at the transboundary level. Technological innovations based on satellite information, in combination with ground-based data, can be transformed into information that can prove vital in saving lives and properties. For example, the Koshi Flood Outlook (www.icimod.org/?q=14181) being developed by the International Centre for Integrated Mountain Development (ICIMOD) and its national partners in Nepal and India has high potential for saving lives and properties in the basin. Such efforts should be promoted widely in the region. During the Jure landslide event of August 2014 in Nepal, during which the Sun Koshi River was blocked for several days, a great concern emerged from the Indian side regarding the status of the landslide and the likelihood of an outburst flood. The flood outlook was helpful in providing important information. This example shows that disaster risk reduction could be an entry point for immediate regional cooperation. This will create trust, which can be a basis for future cooperation for maximizing benefits such as energy trade. Countries of the HKH region should recognize the potential of water resources for sustainable development. These resources can help reduce poverty, improve livelihoods, conserve ecosystems and contribute to flood and drought management in the region. This will not only help us face the present crisis, but also open up avenues to deal with issues of future water availability amid climate and socioeconomic changes. Regional cooperation should be based on the three pillars of sustainability: economic vitality, environmental integrity and social equity, both at the national and local level.